Happy Saint Patrick’s Day! The annual block party begins at Parasol’s on Constance & Third in the Irish Channel at 11:00 a.m.!! I wish I could be there. 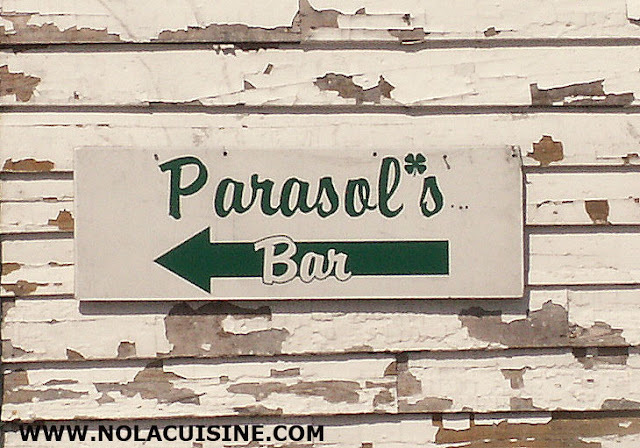 Parasol’s Restaurant & Bar, like any respectable neighborhood restaurant in New Orleans doesn’t look like a place that you would consider eating. Drinking absolutely, eating no. 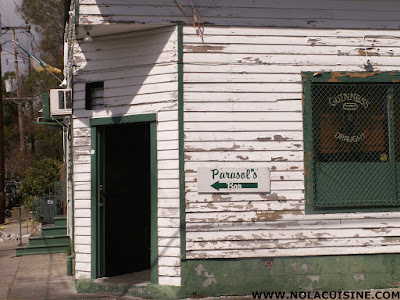 And let me say that this is one of the great drinking establishments in New Orleans, a wonderful hole in the wall bar, almost always packed with locals and whomever else happens to walk or stumble through the door. The kind of Irish Pub with hand written signs that say things like “A 20% gratuity will be added to any credit cards left at the bar. You Drunks! !” This one made me laugh because in my past, I have to admit…guilty as charged. It’s always good to be in a town where you’re among friends. Running parallel with the bar, on the other side of the wall is a somewhat dingy little dining room (I say that with the utmost respect and actually as a compliment), where in my humble opinion, the BEST Roast Beef Po Boy (my Parasol’s style Roast Beef Po Boy Recipe) is served. Detractors can go nuts in the comments section if you like, this is a hot debate, but Parasol’s serves the kind that I like, Roast Beef that is just obliterated from long slow cooking in a rich gravy, smothered with mayonaise, some tomatoes, pickles and lettuce; dressed that is. And that bread! Light as can be, yet chewy, with a crust that is beyond imagine! Now the fun starts. This is also the messiest sandwich I have ever eaten, hats off. From my first bite I was awash in debris, mayo, gravy, up to my elbows. I actually ran out of napkins and had to clean myself by rolling around in a small patch of grass I found on Constance. I’m exaggerating of course, but you know what I mean, good sloppy eating in one of the most colorful little Irish bars I’ve ahd the pleasure of visiting. Speaking of which, tomorrow being St Patrick’s Day, this is the place to be in the city, they annually host a block party that begins at 11:00 a.m. and runs all day long! Wish I was there! Here are some pics of the block party on their website. 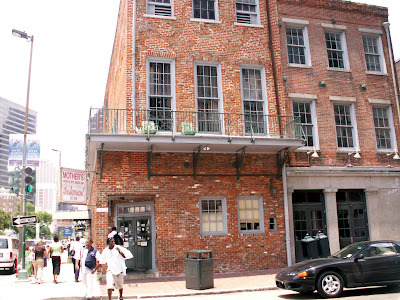 Mother’s Restaurant has been on the corner of Poydras and Tchoupitoulas since 1938, named after Mary (Mother) Landry who originally owned the restaurant along with her husband Simon and their large family. 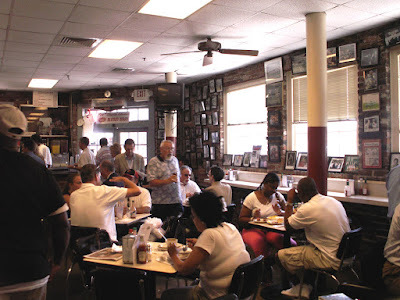 The Landry family owned and operated the restaurant until 1986 when the Landry sons sold the restaurant to Jerry and John Amato, who still run it today. For a full history of the restaurant with lots of pictures visit here. Every time that I have visited Mother’s there has always been a long line, even in the off season, nice to see. The line in my experience contains a nice mix of just about everyone, locals, tourists, lawyers (the courthouse is just down the street), people in suits, people in work uniforms, you name it. 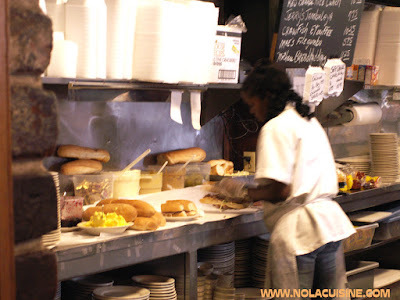 The counter help may seem a bit short, but like any other great busy sandwich shop in New Orleans, New York or anywhere, it’s necessary to keep the line moving. As a matter of fact I refuse to eat at a deli in New York with friendly counter help, and insults only make the sandwich taste better. I’m not saying that the fine folks at Mother’s are rude, just don’t expect chit chat during the lunch rush. 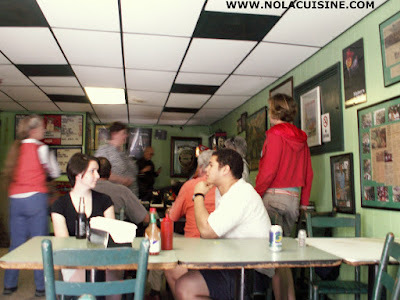 The food is good, great Po Boys, Gumbos and soups, I remember having a really great Turtle Soup on a visit years back with nice chunks of Turtle Meat, not ground as in most restaurants. (My Turtle Soup Recipe) Here is their menu! My favorite sandwich at Mother’s is the Ferdi Special; Roast Beef with Mother’s excellent baked Ham, dressed and with Debris Gravy. The portion seemed a bit leaner than I remember, but then again, maybe I can just eat more now. Actually there is no maybe about it, I can definitely eat more now. I guess the sandwich didn’t get smaller…I’ve gotten larger. 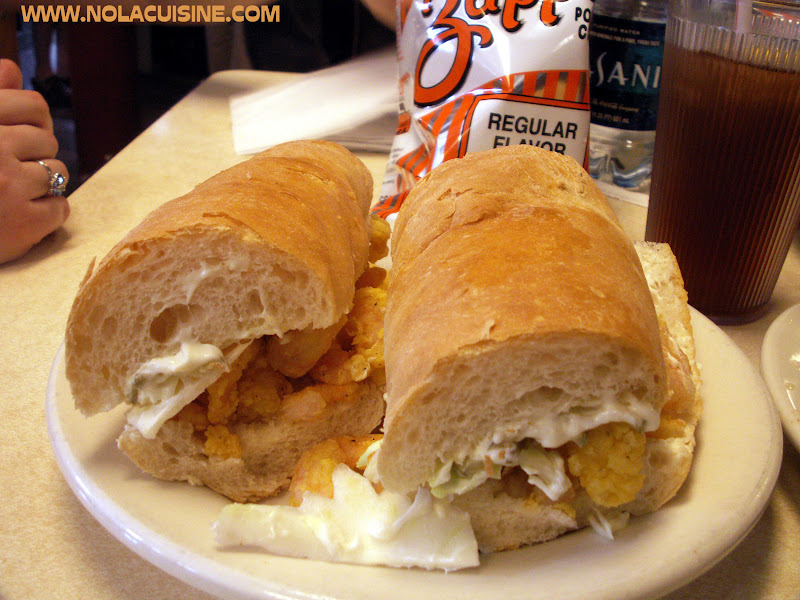 My wife Sheelah went for the Shrimp Po Boy as she usually does when it comes to Po Boys, nice portion of perfectly fried Shrimp, nicely dressed (by the way, Mother’s uses Cabbage to dress their Po Boys instead of shredded lettuce). 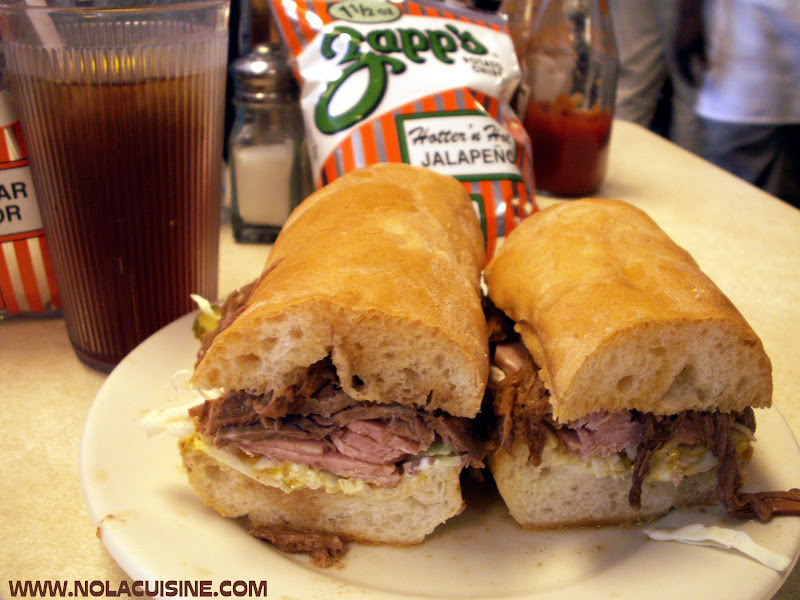 We both had Zapp’s chips with the sandwich, which always just seems like the right thing to do. I have to tell you folks, I haven’t been to Mother’s or New Orleans for some time now and looking at these pictures and writing this post makes me heartsick for New Orleans. Actually this site was founded on my heartsickness for New Orleans and her food, people, music, architecture, vibe, everything. 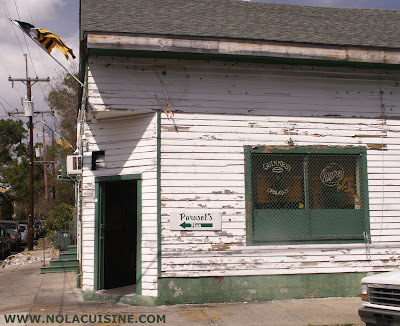 It has warmed my heart immensely to hear from displaced folks from New Orleans and Louisiana who are away from their home, and have found at least a little piece of it via recipes and remembrances from my site. I hope this site can bring a little joy to your life as it has mine. 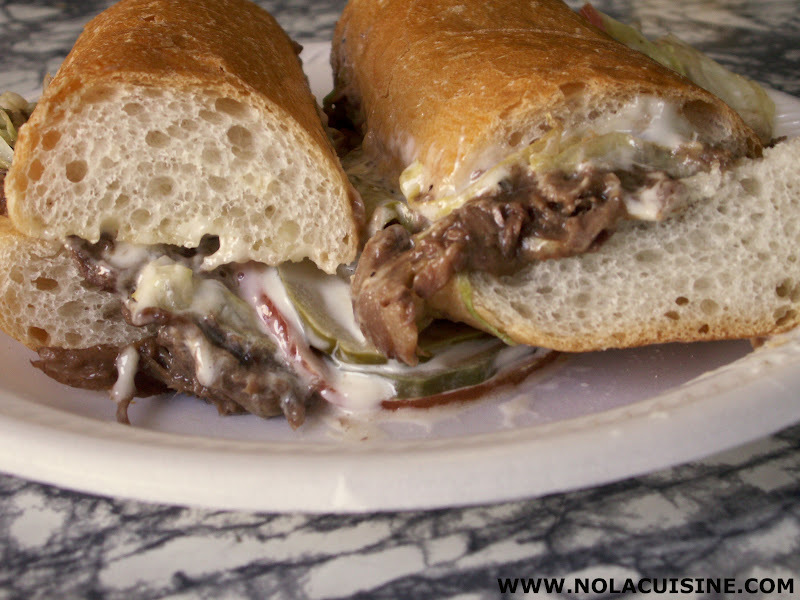 Be sure to visit my ever growing Index of Creole and Cajun Recipes which links to all of the recipes features on Nola Cuisine!